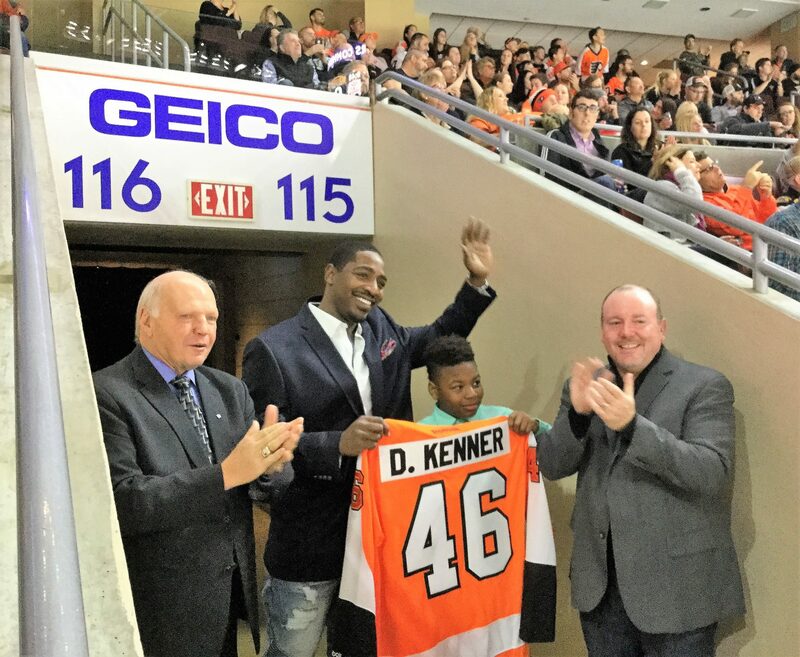 David Kenner, Horizon House's "Flyers Community Teammate"
Philadelphia Insurance Companies, a Philadelphia Flyers sponsor, and one of our insurance brokers, was instrumental in Horizon House being chosen to be honored as a Flyers Community Teammate. While a very great honor, the most difficult task was to identify only one of Horizon House’s many dedicated staff for this distinction. As difficult as it was, David Kenner, our InSHAPE Health Mentor was selected to represent Horizon House during the November 29th Flyers game at the Wells Fargo Center. David’s work with individuals we serve is only one example of Horizon House focus on the needs of the “whole person” as we strive to “build healthy communities.” He meets individuals where they are and helps to build rapport and self-esteem. He goes above and beyond to help create consistency in the lives of the ever increasing number of InSHAPE members to exercise and to think about their well-being. David motivates peoples to desire to connect to activities in the community, to want to work out, to want to eat healthy, to challenge themselves to lose weight, and to walk. His walking group was so motivated that they walked the equivalent distance from Philadelphia to New Orleans. How does he do it? He does it with kindness and respect. When asked about David during a recent interview, KB said, “My attitude about myself is much better. I like myself better.” Those few words are a testament to the great work David and the staff of Horizon House are doing. Our hats are off to David for the magnificent work he is doing with and for the men and women we serve.